Cooling of the brakes is essential - particularly on 'heavy braking' circuits or events. The heat generated during braking is stored in the discs and must be dissipated by air-flow through and around the disc. Failure to do this will result in reducing brake efficiency and in the extreme, increasing brake pedal travel and loss of retardation. Brake heat is removed by using ducted air directed into the 'eye' of the disc, through the internal vanes - and across the braking faces. It is important to ensure that the heated air escapes from the wheel and wheel-arch - otherwise air-flow is restricted and temperatures will increase. This is very much vehicle specific, there are no general rules. BLEEDING Whilst there is some 'mystery' about this, it is basically a simple operation. The objective is to ensure that all air is purged out of the system(s) so that only good, fresh brake fluid is in the calipers, master cylinders, pipe-work and hoses. Traditionally, arrays of long, straight or curved grooves are staggered around the disc surface. 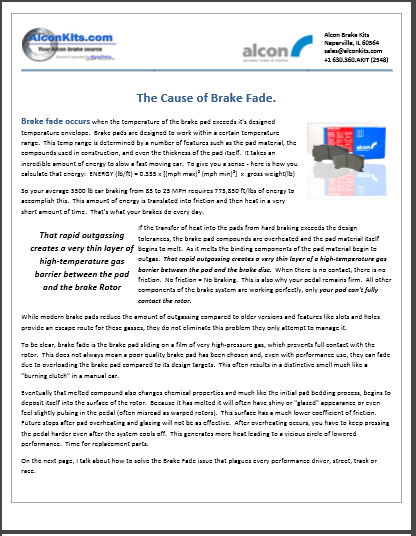 Heat generated during braking leads to thermal distortion of the disc due to the discontinuous friction rubbing surface produced by the grooves, causing reduced pad contact and in some cases brake judder. 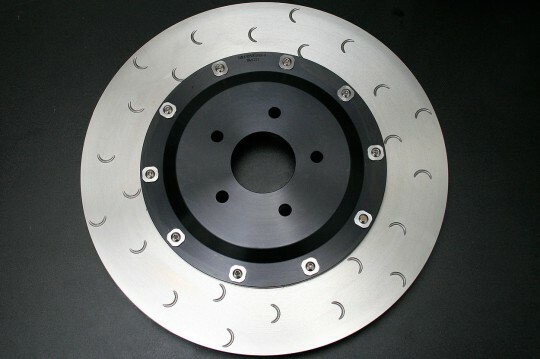 As a result of dividing the grooves into short segments, the continuous disc surface area is maintained, helping to reduce thermal distortion and hence brake judder. 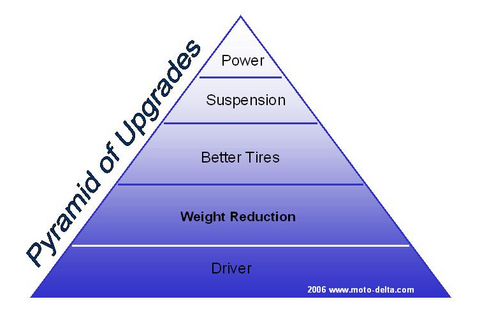 Suprisingly one of the least effective upgrades (within a reasonable budget) is power. What? That’s correct. Sure if you have an unlimited budget and can turn that wheezing 6 cylinder into a 1000 HP monster you’ll pick up some significant time (and a few pairs of soiled underpants) but for the rest of us without a money tree there are more effective upgrades. Now read that list again. I’ve listed it in order of effectiveness. You’ll notice that YOU are at the top of that list. Remember you’re the first round draft pick for your own track team, so invest your money in yourself first!